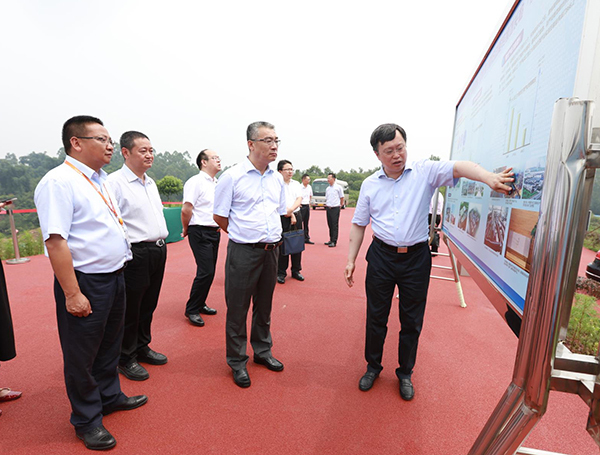 On July 19th, Mr. Wang Yanfei, Standing Committee Member of the CPC Sichuan Committee, Secretary of Sichuan Discipline Commission, Secretary of Sichuan Provincial Supervision Commission, inspected Yongxiang New Energy project. Mr. Wang Xigang, Secretary general of Sichuan Discipline Commission, Mr. Xu Qiang, secretary of Sichuan Discipline Commission Research Office, Mr. Peng ling, Secretary of Leshan Municipal Party committee, accompanied through the inspection. Mr. Li Bin, Deputy General Manager of Yongxiang Co., Ltd., General Manager of Yongxiang New Energy warmly received.